February 4, 2015 (Wortham Texas) – The AMA Women’s Motocross Cup (WMC) is proud to announce the support of Suzuki Motor of America, Inc. to this year’s event held at Freestone Raceway from March 17th-21st. The AMA Women’s Cup will be featured as part of the James Stewart AMA Spring Championship along with Round 2 of the WMX Series. 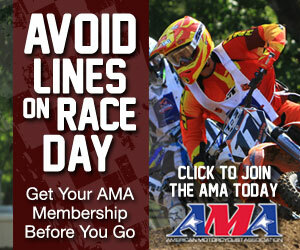 The AMA Women’s Cup offers classes specific to girls and women’s classes from 51cc to Vet’s. This unique, one-of-a-kind race provides the female racers of our industry the opportunity to be on the same pro national track as the other amateur riders attending the JS7 Spring Championship. Champions of the Girls Jr, Girls Sr, Womens 14+ and WMX classes will also be invited to join as part of the James Stewart Champions Ride Day as a bonus in taking home a class championship. These same riders are welcome to participate in any of the other classes offered during the week of March 17th through the 21st. All early registration can be found on the Freestone website under the “Online SignUp” page. Note that the Girls Jr, Girls Sr, Womens 14+ and WMX are part of the Spring Championship registration, and the remaining six (6) AMA Womens Cup classes are separate. For more information, stay tuned to www.WomensMXCup.com or follow us on social media @womensmxcup. To get signed up for factory contingency from Suzuki, go to http://www.suzukicycles.com/Racing/Motocross/Contingency.aspx. Suzuki Motor of America, Inc. (SMAI) distributes Motorcycles, ATVs, Scooters, Outboard Motors and Automotive Parts and Accessories via an extensive dealer network throughout 49 states. Suzuki Motor Corporation (SMC), based in Hamamatsu, Japan, is a diversified worldwide manufacturer of Motorcycles, ATVs, Scooters, Automobiles and Outboard Motors. Founded in 1909 and incorporated in 1920, SMC has 147 distributors in 201 countries. For more information, visit www.suzuki.com. This entry was posted in News and tagged contingency, suzuki, womens cup. Bookmark the permalink.